Great quality, very comfy. Beautiful set! Create a comfy, cabin bedroom with this plush Pioneer comforter set from Madison Park. The over-filled polyester comforter features a herringbone print and a classic buffalo plaid pattern with matching shams. Each unique decorative pillow features hand-stitched embroidery to add to your custom bedroom decor. This comforter set is awesome! I love the weight of the comforter and the colors are so vibrant! Would buy this again!! I love how soft and warm this comforter is! 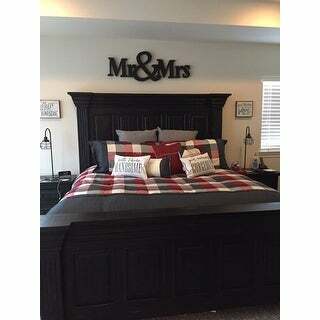 It is exactly as pictured and matched our master bedroom decor perfectly. It washed really well. Great quality, I am very happy with this product. I ordered the king size in grey and I am very impressed with how the comforter and pillows look exactly as they do in the pictures. Material feels great. I love that it came with shams &amp; throw pillows! It looks so pretty in our bedroom! Love it! I love my comforter, the colors are perfect for my bedroom. It comes with 3 pillows that match. Yes I would recommend the comforter to my family and friends. Fast shipping too! This is a good quality bedspread.The colors are as shown in the photo. I gave it only 4 stars as there are a number of little tags that are unsightly--I had to cut them off carefully. Otherwise, it brightens up a room! This comforter set is very nice quality and attractive. Accent pillows are perfect size, and also very high quality. Purchased for my spare bedroom, but would certainly use in my Master. Love it! The colors are great and it goes well with rustic/farm house look! The length is great for my King size bed. I purchased the Cal King and it was just right. he white is a little more of a cream color but looks great with the red. Fits queen bed nicely. Purchased for guest room and the extra pillows gives it a nice, finished look. I am absolutely thrilled with this comforter set! It looks incredible and the quality of the materials used to make it are extremely durable. The comforter is very soft and the price for this 7 piece set is unmatched, as I haven't found it this cheap anywhere else. It was well made, great colors. Best complete look. Good quality. Although a little light weight than I like for winter. Will be good in the summer, on hot nights. It added great color to our room! I ordered the Gray set and love it!!!! I love this bedding! Great quality and looks great! Exactly as described and pictured. Very comfy! I loved this online and I love it more in person. I purchased it for my 19 year old son's room. The guality and thickness is very nice. Very happy with the purchase. This is my first Overstock comforter purchase. "Is the red color more burgundy?" This color is more red. "How well does it wash...is the filling changed after washing?" This will not be an issue if care instructions are followed correctly.